Photons, which can excite chlorophyll in thylakoid membranes, have peculiar properties that will revolutionize how we’ll use computers in the next few decades: “Data can be encoded in light pulses by modulating the amplitude or phase of the light. 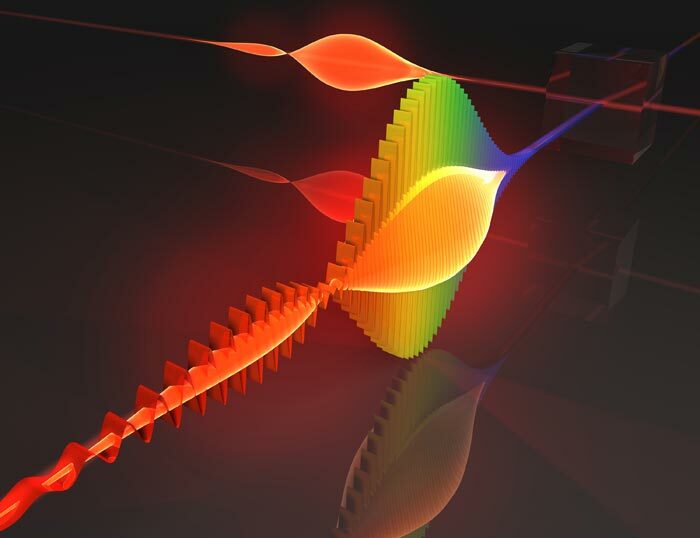 Single photons and other quantum light states can also be generated in a variety of complex shapes and encoding information in these different shapes could be an efficient way to securely transmit data. Indeed, a single photon shape could represent, for example, any letter in the alphabet, or even a quantum combination (or superposition) of several letters.” — Via. The following videos and links are good resources for the study of Photosynthesis–especially light dependent & light independent reactions (a.k.a. carbon fixation; a.k.a. The Calvin Cycle). Light dependent reactions summary, via McGraw Hill: link here. Calvin Cycle summary, via McGraw Hill: link here. Thank you very much for posting this video! It helps me understand this topic a lot more clearly, especially because photosynthesis itself can be a little difficult to understand. When I was watching the first video about Light Reactions, I was very surprised to hear about the theory that revolutionary biologists have that organelles where once independent organisms that teamed up to create the organisms that we know today. It certainly makes sense knowing that each organelle has its own DNA and it also makes me think, as the man explaining in the video said, about what it is that we might evolve into. Remember, Isabella: only those organelles that have an endosymbotic past with eukaryotic cells–i.e. chloroplasts and mitochondria–have their own genetic material. I saw this video, it’s not that relevant but it reminded me of the class discussion on colors and how they aren’t truly real, but we are able to perceive them. A very interesting video. I love VSauce. Great find. It’s mind boggling, having discussed this topic for weeks and feeling like I understand it in its most broad terms because, of course, we’ll never fully know because there’s always more to discover, the functionality and rhythm an organism partakes in. Especifically speaking, the plant is just this widely functional entity that does things inside of itself constantly to provide for its own self and for us. I think it’s very interesting that plants take advantage of all their products in photosynthesis that they don’t send out to the atmosphere to reuse in their metabolic cycles. What I find especially mind-boggling about photosynthesis—it’s photon dependent reactions—, is what happens in photosystem II; the oxidation of a water molecule, which yields molecular oxygen to the atmosphere—oxygen that aerobic organisms, such as ourselves, need to power their catabolism of carbohydrates. I find it amazing how life can supply itself and cause chains that go on and on. Light reactions produce the materials needed for dark reactions to take place meanwhile the dark reactions make the materials light reactions need. They depend on each other, this is an example of the interdependence of life on Earth. We call this chains photosynthesis and they produce materials like oxygen and glucose which are essential to both plants and humans. http://twinkle_toes_engineering.home.comcast.net/~twinkle_toes_engineering/photosynthesis.htm In this website the 14th picture I feel summarizes the interdependence among the reactions in an easy and simply way . Photosynthesis is a fundamental biochemical process that will continue to inspire scientists, engineers, artists, etc., to do work that changes the way we live—hopefully for the good. Photosynthesis has always been a problem for me in biology. I really have trouble understanding the process itself, but this video was really helpful. What really amazes me is that nature is capable of sustaining itself without the help of humans. Plants cannot be taught to do anything because they do not have a brain, but what is very interesting is that plants do photosynthesis like when we breath. It is an instinct for them. Plants go through photosynthesis constantly in order for them to survive; indirectly they also help plant-eating animals to survive. They also help us to get the oxygen we need for breathing. FUN FACT: 70% of the world’s oxygen is produced by phytoplankton photosynthesis in the world’s oceans. What is really great about nature is that it tries that all the processes its organisms go through, make a healthy environment for humans and other animals to live in. When we adopt an animal or give it the food they need, we are taking part in this great cycle. In conclusion, life on Earth is really a big cycle that consists of many little process. At the end, they all have one goal: to make Earth an environment capable of sustaining life. I understand why photosynthesis can be overwhelming. Metabolic pathways are complex, nuanced, intricate, continuous, etc; but they, nevertheless, are the best models we have to understand how life is possible on Earth. And photosynthesis is life’s most important metabolic–anabolism–pathway: it can harness the power of a star. By analyzing photosynthesis I can analyze a Short and Good way to describe this process:Plants use sunlight to turn carbon dioxide from the air, and water from the soil into food and into sugar. Sunlight is a kind of energy, and plants make sugar to store up energy. Plants make oxygen at the same time. If we eat the plants and breathe the oxygen, then our bodies can turn the sugar and the oxygen back into water and carbon dioxide, and then we get to use the energy. I totally forgot about the virtual cell videos. Great find, Giancarlo. Woow! This is very useful for studying for finals. In the process of understanding photosynthesis this is very useful because it provide well-gathered information. These are the two “stages” of photosynthesis. The light dependet reaction is the first one and it is reliant on sunlight. The energy from the sunlight, along with water are converted into ATP and electron carrierier. The light Independent reaction takes the energy and electron carriers from the previous reaction and uses them to turn carbon dioxide into glucose. This reaction doesn’t need light…but it will cease if it uses up all the chemical energy. This reaction happens in th stroma of the chloroplast. I find really surprising and incredible how all plants undergo everyday all of this processes and how it all can happen and we don’t see it. I honestly find photosynthesis really complicated so thanks for the videos. Also its incredible what technology would be able to achieve and that we will be able to encode data in light pulses. I encourage you to do research on chloroplasts and photovoltaic cells. Photosynthesis is so complex. In elementary school they just tell you that photosynthesis is the way plants make food, but once you reach biology and you study all of the processes the plant goes to in order to perform photosynthesis you are literally overwhelmed with all this new knowledge that you acquire. Photosynthesis is very important to human life also. Thanks to these processes is the reason that we have oxygen. This is a very good explanation of how important photosynthesis really is in order for life to occur in this planet. We can spend a whole school year talking about the intricacies of Photosystem II. I am totally with you Kate, in elementary school they made it seem so simple. Now in this Biology course it is impressive the complexity of this process. I am looking foward to learning more on the complexity of other processes which we learned in elemenary school the simple way. Carbon Fixation is the conversion of carbon dioxide into organic compounds during Photosynthesis. It mostly refers to the processes found in autotrophs (organisms that produce their own food), usually driven by photosynthesis, whereby Carbon Dioxide is changed into sugars. Photosynthetic organisms use sunlight to create energy which is stored in the form of several chemical compounds. In the Calvin Cycle, the energy is used to transform Carbon Dioxide into a sugar in a process which is sometimes referred to as Carbon Fixation. Life has an amazing ability to make everything “click”. By this i mean that it is so perfect how every waste product of any reaction is consumed by another in a way that everything gets put to use. Life is a cycle, and as we study it in class we find interdependence among everything on this universe. Can you use «emergence» and «interdependence» on a single sentence? It is amazing to see how nature works and how this process helps life exist. This clearly is a complicated process with multiple steps but the results are simple and concrete.What surprised me most is the role of sunlight in our daily life, how necessary it is and how much it helps, not only humans but everything around us. In photosynthesis, I would say is one, if not the most, important ingredient. The sun is always there and we could use it in so many ways but sometimes we do not even realize it, renewable energy for instance. I hope that one day people realize that the thing that give us light, day and night, is also our biggest source of energy. Studying for finals this blog post has been very useful. Photosynthesis can come across as a simple process, but when looking at the details, it is more intricate than what is believed. Photosynthesis is essential for the existence of all living things. Animals and plants both synthesize fats and proteins from carbohydrates; thus glucose is a basic energy source for all living organisms. The oxygen released during photosynthesis, provides most of the atmospheric oxygen vital to respiration in plants and animals, and animals in turn produce carbon dioxide necessary to plants. Photosynthesis can therefore be considered the ultimate source of life for nearly all plants and animals by providing the source of energy that drives all their metabolic processes. Indeed. For life to happen, the power of a star has to be harnessed—& harvested. And autotrophs—plants & algae—are very good at that. The interaction between us and photosynthesis is extraordinary! If it weren’t for that we would not breathe. Just by thinking that we depend on a plant for life through photosynthesis is very MIND BLOWING! I also researched and found that cellular respiration and photosynthesis have an inverse relationship. After reviewing the concept of photosynthesis and its vital importance for our existence one should be reminded of the constant deforestation on Earth. Something must be done to stop it. It will not only help enhance our environment, but also our living conditions. Actually, architects, biologists, & engineers, have collaborated in designing buildings that have built-in autotrophic ecosystems made out of highly photosynthetic algae. These are part if the energy output of the whole structure. Photosynthesis had always been so simple for me until now which I truly understand and comprehend its full complexity. These videos were of great help because to read about it can be confusing but with the diagrams and drawings, it is much more simple than what I was expecting. Life is so complex and diverse and everything has its own mechanism even the most detailed things, but once we learn about them, we can fully understand their purpose in life, like photosynthesis which plays a very important role. Photosynthesis always seemed to be a pretty simple process: plants use the energy from sunlight, and nutrients from the soil to make glucose. That’s it. But while looking through this post and watching the videos, I realized that photosynthesis is actually way more complex than I thought. It is amazing to see how plants are able to carry out such complex processes and how essential they are to our planet considering they are a main source of oxygen. Indeed. And it’s complexity is what makes it so wonderful. To transform the energy of a star is no small task. No wonder photosynthesis is so complex. It’s amazing how life can sustain itself, and it makes me wonder how much farther along nature and the organisms within would have evolved without the interruption humans have created. It is amazing how photosynthesis works on a plant cell. These videos helped me to study for the final and cleared out a lot of my doubts since it explains photosynthesis quite well. It is just fascinating how from a simple procedure, great and significant things occur. Life would not be possible without photosynthesis. I always had a bit of trouble understanding all the complex reactions that took place in photosynthesis. These videos helped me understand a bit more about inner workings of photosynthesis. While looking for more information on photosynthesis, I stumbled upon this article: http://www3.imperial.ac.uk/newsandeventspggrp/imperialcollege/newssummary/news_6-2-2009-10-43-8. It talks about how they took pictures of how the sun’s energy moves in plant with a new laser technique. This article shows the cross-referenced nature of photosynthesis: chemistry, physics, & biology. When studying light dependent reactions or photosynthesis it is amazing to know that it all starts from photons hitting photosystem II and exciting the electrons for the whole process to commence and continue its ongoing and everlasting cycle. It is mindblowing to know that the source of light or energy that plants get from photons can be used to revolutionize modern technology. Time and time again mankind has found ways to mimic nature in ways that have revolutionized our experience on this planet more than once. Flight is an example. With light reactions and the calvin cycle, photosynthesis is possible. These cycles are important for life and are needed. In light reactions,with the help of photons, NADPH is made. With ATP synthase, ATP is created. When water enters, oxygen is produced in the electron transport chain which is an important factor for life. Later the NADPH and the ATP, which are produced in the light reactions, is used in the Calvin cycle. In the calvin cycle, ADP and NADP+ is made from the NADPH an ATP and then are used for the light reactions. The light reactions and the calvin cycle are also like a cycle because the things that light reaction produces, the calvin cycle will use and what the calvin cycle produces, the light reaction will use and this is very important for photosynthesis. Searching a little more about the pigments in contrast with light, they are molecules that absorb specific wavelengths of light and reflect all the others. The color we see is the net effect of all the light reflecting back at us. Electrons in molecules can exist at specific energy levels. Normally they exist at the lowest possible energy level they can. However, if enough energy comes along to boost them into the next level, they can absorb that energy and occupy that higher level. This is what pigments do. The light they absorb contains just the right amountof energy necessary to push them into the next level. Any light that does not have enough or has too much energy can not be absorbed and is reflected. All of the colors are really nothing more than lights absorbing and reflecting which has to do a lot with the plants and photosynthesis a very interesting topic to study more deeply. It is amazing how scientists have been able to incorporate nature’s amazing functions to functional technology. HyperSolar Inc had been planning to develop a method to do artificial photosynthesis. This artificial photosynthesis process is done by splitting water into hydrogen and oxygen. With this they have developed silicon solar cells. When analyzing photosynthesis I can describe this process in a short and easy way: Plants use sunlight to turn carbon dioxide from the air, and water from the soil into food. Sunlight is a kind of energy, and plants make sugar to store up energy. Plants make oxygen at the same time. If we eat the plants and breathe the oxygen, then our bodies can turn the sugar and the oxygen back into water and carbon dioxide, and then we get to use the energy. The process of photosynthesis is one of those processes that I always wondered how it could have been discovered. Well, in the 1600s, Jan Baptist van Helmont carried out an experiment in which he planted a willow tree in the soil, and weighed it after five years. Since the tree was heavier yet the soil remained the same, Jan concluded that the extra weight must have come from somewhere inside the tree. Also, in the 1700s, Joseph Priestley put a mint plant in a container with a burning candle. The flame used up the oxygen and burned out, however after 27 days, he was able to relight it, proving that the plant was producing oxygen. Without these discoveries, we might not understand as much about photosynthesis as we do today, even though we still have a lot to learn. These videos helped me a great deal to better understand the process of photosynthesis, so thank you very much for the videos. In addition to those videos, i found this one: https://www.youtube.com/watch?v=sQK3Yr4Sc_k which also explains photosynthesis in an entertaining way. On another note, I find the endosymbiotic theory to be intriguing. The fact that the mitochondria and chloroplast could’ve been their own organisms a very long time ago makes me wonder if it’s possible that in the future, the mitochondria and/or chloroplast could separate from the cells they’re currently in, and if so, what would happen to us and the plants? Although that’s highly unlikely of happening, the thought still ponders in my mind. Speculations are useful tools in science, Laura. I’ve asked myself the same ‘what if’ type of question: would we be here, using our opposable thumbs and huge brains, without that single endosymbiosis, billions of years ago? It’s truly mesmerizing to learn to see how plants survive in their environment and to acknowledge that they don’t really need us as much as we need them. Granted, it is a very hard and complex subject to understand and grasp, once you get the hang of it it becomes a wonderful experience. My favorite part was learning about photosystem II, which is is the first link in the chain of photosynthesis. It captures photons and uses the energy to extract electrons from water molecules.